Colonel Marbles Miniatures Showcase - Bears !! 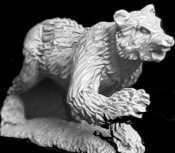 The purpose of this webpage is to offer possible alternative miniatures to use for Bears in your Wood Elf or maybe Norse army as well as (or even instead of) those produced by Games Workshop. This is a classic figure I've had in my collection for 20 years or so. 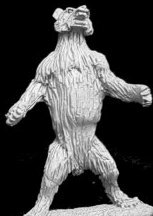 These are not the greatest sculpts ever - the one standing upright is pretty poor tbh - but they will help bulk out your regiment of Grizzly's ! 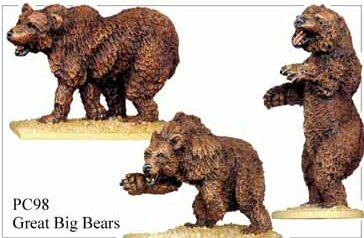 This is a reasonable figure - from Mithril's 'The Hobbit' range - it represent's the shapechanger Beorn in bear form. Top of the range figures from the ever dependable Mark Copplestone. This is a cracking grizzly ! Great pose, great details - a must for any self-respecting band of bears. This figure comes from German company Armalion. Haven't seen it in the flesh, but looks ok from the pic. I have this one in my collection. It's about the size of the Foundry bears, but with a slightly less realistic bear anatomy. Nonetheless, it's a good model, that deserves to be added to your existing unit for more variety and that will fit right in with the others.